As I write this, Hurricane Harvey is pouring multiple FEET of rain over a huge swath of Texas. It is Monday, August 28th, 2017. 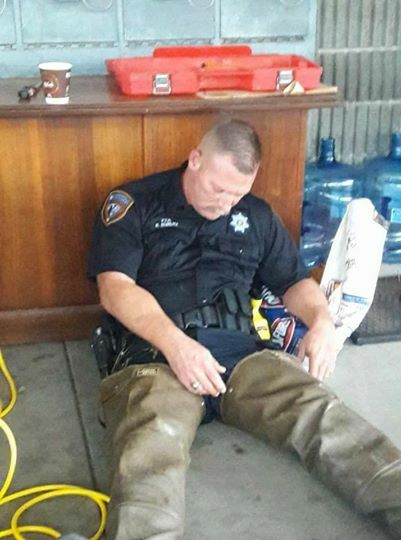 Flooding devastates all of southeast Texas; Houston is literally inundated. The fourth largest city in America has no safe, passable highways. Residents are without power, running out of food and supplies; houses and businesses are taking on water. Just two weeks ago, DJT “reversed President Obama’s executive order from 2015, ‘Establishing a Federal Flood Risk Management Standard’. Obama’s order raised elevation standards for new federally funded projects to better withstand flooding, but now, federal dollars for repairing Harvey’s damage will require building standards that disaster-risk experts consider too lenient.” See article from Grist Magazine. 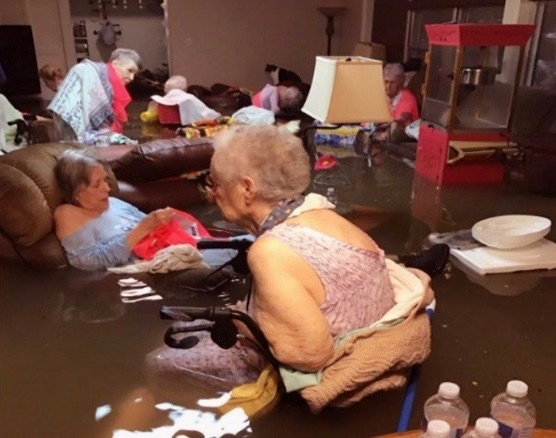 Fortunately, residents of a Dickenson, TX retirement home were rescued by helicopter after sitting patiently in water up to their waists and rising. Thousands of rescues have been achieved thus far; hundreds are in the queue as rescue workers collapse from fatigue. As torrential rains continue, water pressure is threatening the security of upstream reservoir dams and must be relieved. In unprecedented events, decision makers must guess at what is the best of all the worst-case-choices. Their decision to do a controlled release of thousands of cubic feet of water per second may save the dams but will surely add to the already devastating flooding around the Bufflao Bayou, which runs right through downtown Houston. Recovery from this epic catastrophe will likely take years. People interviewed on television are being asked to compare and contrast this hurricane to others they have endured. Their answers are pretty much the same; in effect, no respondent has ever seen anything like this, nor could they have imagined it. 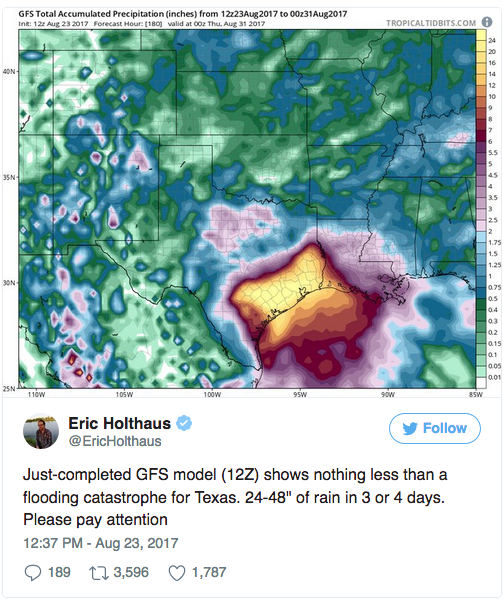 Days prior to Harvey making landfall, predictions were made of it stalling over the area, dumping record amounts of rainfall of two to four feet. That’s right, FOUR FEET! There have been the usual “this came out of nowhere” and “we didn’t think it would be this bad” statements from officials. This is very unfortunate and irresponsible… this event was very well forecast and advertised for several days in advance. Forecasts of widespread 15-20″ totals with some areas seeing 40 inches or more will verify. As someone who tries to get this information out, it’s frustrating and infuriating when people who should know better claim they had no warning. The general public seems to fear the category rating of a storm more than the rainfall forecast, yet rain is historically responsible for 3.3 times more fatalities than wind for hurricanes hitting the United States. Storms like Harvey may help to make the public more aware that rain is a very big deal, even though it’s not a part of the Saffir-Simpson category rating. Despite the dire predictions about Hurricane Harvey, many individuals chose not to evacuate. It was not only individuals who dismissed warnings. The potential devastation of a storm like Harvey hitting Houston has been known by officials in Texas for years; yet few of the necessary precautions were implemented by them in time to minimize the dangers. The following is excerpted from the full text of Hell and High Water by Neena Satija and Kiah Collier for The Texas Tribune, and Al Shaw and Jeff Larson for ProPublica, March 3, 2016, 8:59 a.m.
State leaders had known the specifics of a worst-case hurricane years before Ike. In the mid–2000s, then-Gov. Rick Perry’s office asked researchers at the University of Texas at Austin’s Center for Space Research to imagine monster storms pummeling the Texas Coast. They predicted that such a storm hitting the Houston area could cause $73 billion in damage and harm hundreds of industrial and commercial structures. “Very likely, hundreds, perhaps even thousands would die,” the Houston Chronicle wrote in 2005, describing the scenario. The storm would also flood the homes of about 600,000 residents of Harris County, home to Houston, the newspaper said. Around the same time, Harris County hired a local firm to do similar work and engineers there reached much the same conclusions, the article noted. Officials presented the research all across the state’s coast in 2005. Soon after, hurricanes Katrina and Rita hit the Gulf Coast, prompting national discussions on storm preparedness and response. But all that work did not result in any concerted effort to build a storm surge barrier. Inaction persisted even after Ike, some say. “There was not a whole lot of support from the state as far as seeking — or even expressing the importance of seeking — funds” to study a solution, said Sharon Tirpak, project manager for the Army Corps’ Galveston District. Similar stories were reported during Hurricane Katrina. What’s up with this pattern? predictable though uncertain (altering behavior, speed and/or trajectory). What are the risks/rewards to be expected? How likely is it to come my way? How far away is it (in units of distance)? How long before it gets here (in units of time)? The analysis above pertains to making proactive decisions. If something offers a potential increase of resources (+), how much risk/expense are we willing to gamble to attempt acquisition? If something threatens a depletion of resources (-), how much are we willing to invest toward its avoidance? The best time to prepare and protect ourselves from potential harm is, of course, well-ahead of the destructive event, while there is adequate time to plan, save/raise funds and execute sensibly. Ironically, as the next list reveals, the farther removed we are from an impending event (by space/time or by comprehension), the less likely we are to initiate such precautionary efforts. the less we invest in its avoidance. Why did the officials of Texas years ago refuse to plan for the eventuality of a hurricane of epic proportions? Well, organizations are composed of people; so the general tendencies of those constituents get amplified in the operations of the uniform collective. Both personal procrastination and institutional inertia are the same phenomena, differing only in scale and scope. Inadequate proactive planning gambles that better reactive faculties will win the day. Before we take such a bet, let’s consider how some of the Houstonians who faced drowning in their homes were barefoot when they were scooped up by rescuers and pulled into a hovering helicopter. Their last-minute rescues did not allow time to grab shoes, or any other essentials! They barely made it out with their lives. So the question is this: When Hurricane Harvey was known FOR CERTAIN to be monstrous and merciless, why did so many people still fail to flee? 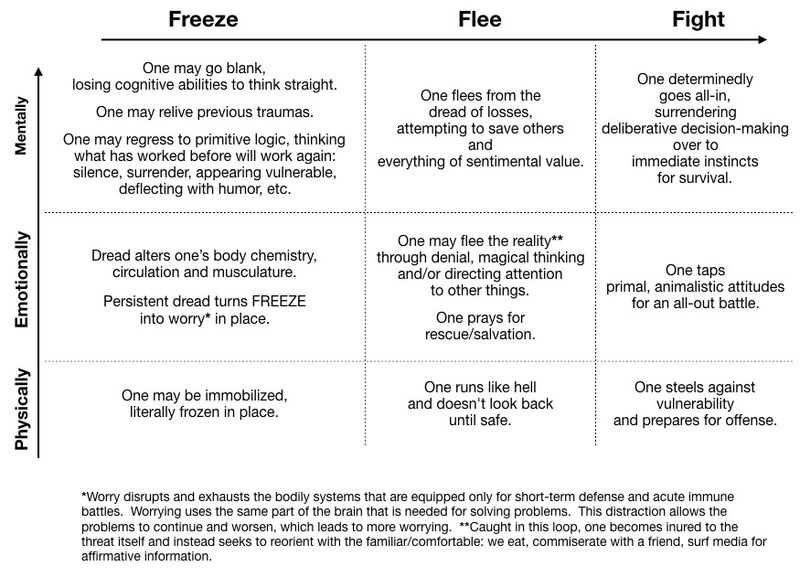 When facing abject destruction, our instinctive reactions include FREEZE > FLEE > FIGHT, usually brought to bear in that order. In studying this chart, recognize times when you have reacted in one or more of the manners described. Our ability to reason gives us the opportunity to plan ahead (when not under duress) in order to insure the most appropriate behavior will be enacted effortlessly when the time comes. Reason must be used in advance, though, as it is unreliable in the midst of a traumatic event. Once triggered, default behaviors override reason. This is not to say that we are stuck forever with our automatic reactions. This I know from experience, having acquired PTSD early in life and overcome it late in life. We are taught to add and subtract on a number line. Between the number line’s integers are equal intervals called units. The unit chosen to represent a situation is a matter of convenience and convention. When we wonder how much time remains before a cyclone hits land, we think in units of time: days, hours, etc. ; when we wonder how much distance separates us from the storm, we think in units of miles; storm surges are estimated in units of feet; and rainfall is predicted in units of inches. In the recesses of our minds we count off units, more of them moves us farther to the right and less of them moves us backwards, to the left. As we glide gradually across the continuum we perceive a smooth, analogue progression, like the movement of big and little hands around a clock face. By middle school we learn that the units of distance and the units of time relate to speed. Speed of man-made vehicles is told in miles per hour (mph). Speed of light is told in meters per second (m/s). If the number of time-units remains the same while the number of distance-units increases, we understand that speed has increased proportionally. If the number of distance-units stays the same while the number of time-units increases, we understand that speed has decreased proportionally. This concept of linear relationship, induced within us at a young age, is a logic that we continue using (rather unconsciously) for making predictions. Our intuition about units tells us the difference between 1 and 2 units is the same as between 4 and 5 units. 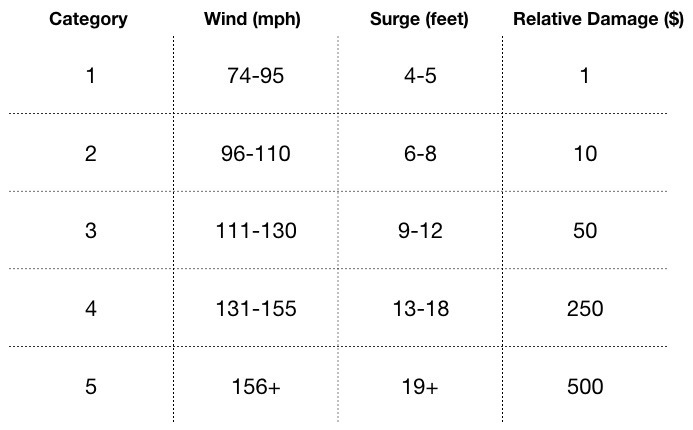 Applying this logic can cause us to misconstrue the television meteorologist, who predicts the strength of a hurricane and assigns it a category, using the 1 to 5 Saffir-Simpson Hurricane Scale. Because wind causes storm surges, the stronger the wind the higher the surge over sea level: 4-5 ft. above sea level is Cat 1, 6-8 ft. is Cat 2, 9-12 Cat 3, 13-18 Cat 4, 19+ is Cat 5. The chart below shows clearly that there is nothing at all linear about how hurricanes affect us. Between a Cat 1 and Cat 2 storm, damages escalate by a power of 10. A Cat 5 storm is not 5 times worse than a Cat 1 storm; it is 500 TIMES worse! Would a minimal 74 mph hurricane cause one half of the damage that a major hurricane with 148 mph winds? No, the amount of damage (at least experienced along the U.S. mainland) does not increase linearly with the wind speed. Instead, the damage produced increases exponentially with the winds. The 148 mph hurricane (a category 4 on the Saffir-Simpson Scale) may produce – on average – up to 250 times the damage of a minimal category 1 hurricane! It is not that scientists and mathematicians do not understand the non-linearity of natural phenomena, its that the population in general does not understand it. The website mentioned above was not easy to find; and I was looking for it, knowing that these statistics must be out there somewhere. The question is why so many people of able means fail to take appropriate actions when warned of impending disasters. Whereas the first answer has to do with natural instincts, the second answer is has to do with a learned logic that is unnatural — meaning it is less applicable to nature and more so for counting assets and debt. We may count roses in a vase, or the seeds in our clementine, or how many tomatoes we harvested from our back-porch plant; however, few if any of the entities/dynamical systems/processes in the natural world accede to their functions by lining up their units, one by one. Complex and multi-layered processes that unfold and refold in the natural world cannot be counted on a line of sequential units. This false logic of linear thinking goes unchecked to say the least (perhaps it is reinforced) when the wind circling the eye of a cyclone is described as gradually gaining or losing strength and categorized on a scale of 1-5 and when water is measured as if its depth is what counts, rather than its volume and exponential force. A hurricane’s water kills more people than its wind does. On top of Harvey’s storm surges, dozens of inches of rain added to the many flooding problems. Storm surges are measured in feet and rain is measured in inches. What do we think of when we hear about water in inches or feet? We put inches of water in our bathtub to have a warm, cleansing soak. We dive into 8-10 feet of refreshing water at our community pool. These benign-sounding measurements are of the water’s depth only; however, water is actually experienced in three dimensions: length, width and depth. Water that fills a cubic foot container weighs 62.4 lbs. Water moves downstream at 6-12 mph; merely six inches of fast-moving water can knock you off your feet! For each foot the water rises, 500 lbs. of lateral force is applied against anything in its path. Two feet of water will carry away your car. It is imperative that we upgrade our linear thinking with a new logic that enables us to just-as-easily consider the non-linear/exponential effects of seemingly small changes. Global temperatures are measured in degrees. Pollution is measured in parts per million. Acts of violence tell nothing of how many suffer from just one death. How few people control the economy? How many people are living with mental illness, poverty and loved ones in prison? Why is autism reaching epidemic proportions? Sadly, this is not true. If we keep doing what we’ve always done, we are headed toward extinction. The pace at which the world is changing is unthinkable, but only because our logic is deficient. Our consciousness needs to be able to perceive inter-dimensional connectivity and anticipate non-local and non-linear effects. Quadernity’s Nature-Based Number Line is a good place to start.